The first week is always the toughest. All we can do is base our analysis off of last year's statistics, matchups, rankings, cross our fingers, and hope for the best. Although, there's nothing wrong with seeking some else to get going. That's what we are here for. In this article, I will be providing you with my daily fantasy NBA daily fantasy basketball lineup picks for DraftKings on 10/26/16. The DFS lineup picks will range from some of the elite players, to mid-priced options, and value plays on DraftKings. It's best to forget about preseason, to ignore production from the games that don't count. Why? Because the games don't count. Preseason performances may dictate playing time to open the season, but one impressive showing is all it takes to raise an eyebrow. If you have any other lineup questions, you can hit me up on Twitter, @DemetriRafto. Clarkson's appeal lies in his multiple position capability, but also that he plays for the Los Angeles Lakers. Now, you may ask, why is playing for one of the worst teams in the league (last season) something to desire? Well, with Kobe Bryant now watching from home, the production has to come from somewhere. Clarkson is capable of doing what players are supposed to do at his position; score. The three-year guard failed to score less than 10 points in just nine of his 79 games-started last season. Combine that with his ability to sprinkle stats generously in the assist and rebound categories, and you have a breakout threat for an affordable price. He might be coming off the bench as the team's sixth man, but don't let that stop you from drafting him. Yes, you read that right. The Greek Freak is listed as a point guard. When someone 6-foot-11 is capable of bringing the ball up court effectively and is also a triple-double threat, favoring a heavy amount of rebounds every time he takes the floor, it is time to take notice. Especially while his price is as low as it is, because we all know it's going to go way, way up eventually. Antetokounmpo's transformation as a one-guard commenced during the second half of the 2015 season. He'll be in a solid battle, potentially going up against either Kemba Walker or Nicolas Batum (maybe someone taller), in a game that should remain close throughout. Antetokounmpo can provide similar production as James Harden, Russell Westbrook, and DeMarcus Cousins for a lot cheaper. Last season, I favored these two teams quite a bit during Daily Fantasy drafts. Most of the time, I picked on them, stacking against both teams. But I often kept an eye on the Sacramento Kings, picking at least eight of their players multiple times throughout the course of the season, simply because, while they can't defend well, they can score. Afflalo is one of the newest Kings called upon to now fill the shoes of Rajon Rondo alongside Darren Collison. He's also starting, and exceptionally cheap for his ceiling. A revolving door of shooting guards stepped onto the floor for the Kings in 2015, specifically Ben McLemore and Marco Belinelli, but both were unable to provide any consistency for a team lacking at the position. Let's hope Afflalo is the guy. With the exception of Trevor Ariza, the Houston Rockets lack a scoring threat in their front court. Dwight Howard, now a memory, wears a different uniform, leaving someone to fill that big man role; someone who proved more than capable, especially in an absence of that team's star. Ryan Anderson was forced to play without Anthony Davis on the New Orleans Pelicans quite a bit last season, and excelled in that role. Now playing alongside another superstar of the NBA, despite a very turnover-prone, defensive-naive one, Anderson sees a boost in value even before his first minute with his new team. Anderson is an affordable option, capable of breaking out for a double-double on any given night. Oh, and he's playing against the Los Angeles Lakers. I'm loving these prices. I'm also loving anyone that gets to play heavy minutes across from Paul George. Thaddeus Young, finally escaping the haunting Barclays Center, now has new life on a new team, with a ton of potential to produce. Head coach Nate McMillan favored his newest acquisition during preseason, as that will likely continue opening day. His price, for his skill, is way too low. Grab him before his value jumps. Yes, I am stacking the Houston Rockets/Los Angeles Lakers game. Why not? I'm often a bigger fan of focusing heavier on games between two bad teams (that are still capable of putting the ball in the hoop) than I am with any game involving the fantasy-kryptonite San Antonio Spurs. Luol Deng stays in a warm climate, but also gets a change of scenery, leaving Miami. Deng is a veteran coming off his worst points per game since his rookie season in 2004. But his leadership and experience will lead to big things in a Lakers uniform; a leadership role, leading a group of kids. He's cheap and always a threat to hook up a rooster with a bulk of rebounds. This is my favorite position in NBA Daily Fantasy, and likely one of the most important. So my advice, which will also be a part of my guidance throughout the season, is to spend up here. Anthony Davis and DeMarcus Cousins are beyond appealing, and obvious, now that they are eligible for multiple positions, but I am already predicting big things for a guy playing in only his second professional season. Towns averaged a double-double during his rookie campaign in 2015; another statistic I pay a ton of attention to when selecting a squad. It scares me what KAT is capable of after watching him tear it up in his first season wearing a professional uniform. He gets a tough matchup against Marc Gasol and the Memphis Grizzlies, but he should not be faded. Because, who else is going to score on the Nets? If we're asking, my money is on Jeremy Lin (another affordable option to consider), but the majority of production is going to come from Brook Lopez. Lopez is cheaper than a lot of the dominant centers on the slate, and can be just as impressive as any of them. Playing on a very questionable Brooklyn squad doesn't help him, or his fantasy value, but Lopez posted two double-doubles, involving 24-plus points in each, against the Atlanta Hawks last season. Al Horford, then their center, will now suit up in a Celtics uniform, and face off against Lopez Wednesday night. 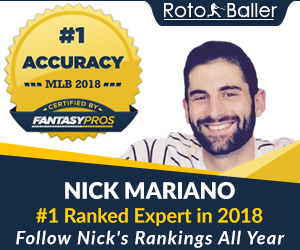 DFS Cheat Sheets and Lineup Picks: Access to 10 deeply researched lineup picks, and sample lineups - seven days a week! Includes advanced stats to unlock NBA player values, and boost DFS success. 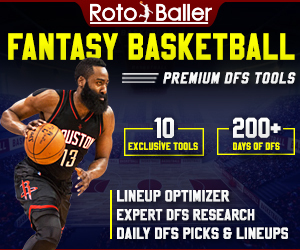 DFS Optimizer Tool: Generate optimal DFS lineups in seconds. Use advanced features and stats for including/excluding players, cash games vs. GPPs, stacks and more. DFS Value Picks: Our Optimizer helps you find, sort and filter the best lineup values and DFS sleeper picks. 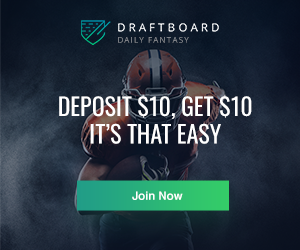 Premium stats like "Usage Rate" and "Points/$1K" give you a leg up on the DFS competition. 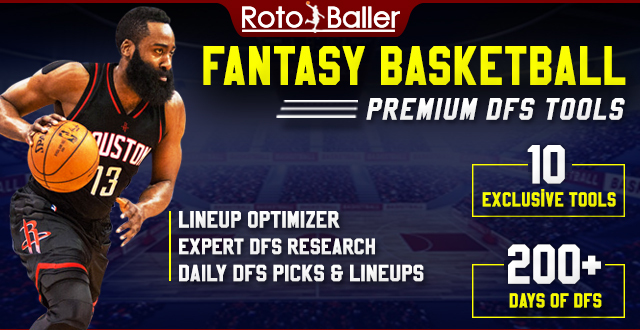 Daily NBA Projections: Our secret sauce - the Optimizer Tool provides DFS points projections for FanDuel, DraftKings and Yahoo scoring.